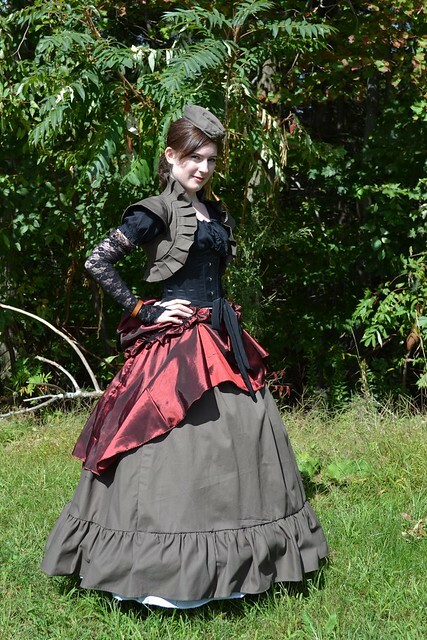 As per requested, today I have some low-resolution progress pictures of my upcoming steampunk which will debut at this year’s New York Comic Con. These pictures were either taken on my cell phone, web camera, or in low light so I apologize for the grain or blurriness, but at least the debut will be that much more special for the image quality. This first picture of a progress picture of the skirt. 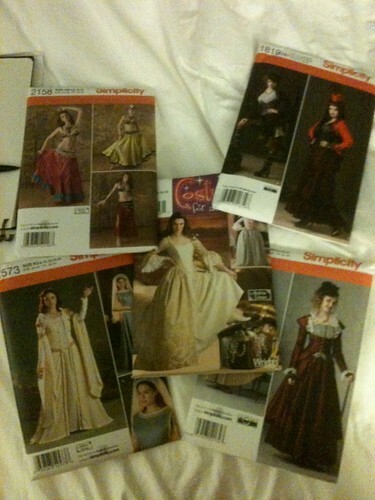 I drafted the pattern myself and it involves a lot of ruffles! The skirt is now complete and this garment alone took about 30 hours to complete. 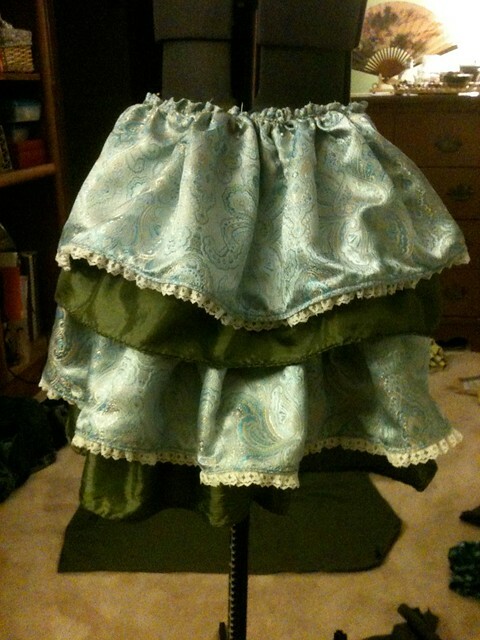 Here’s a picture of the incomplete bustle, which is now also complete. I once again drafted my own pattern and constructed the piece myself using some beautiful brocades and a textured satin. This picture isn’t exactly of progress but it is a compilation of patterns that I ALMOST used. 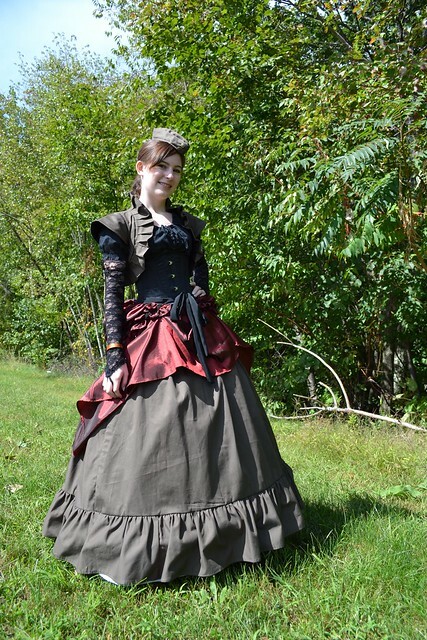 There was a pattern sale going on while I was constructing my steampunk, and while I only used one of the patterns featured here for the top of the costume, I got a lot of inspiration from the pictures and did a lot of sketching and revising on their account. They would all make great steampunk patterns and hopefully they can be useful to you. This is a quick shot of the vest in progress. Those laces will not be final and are just to test what kind I need. Not that kind, that’s for sure. The laces will ultimately go down my whole back. 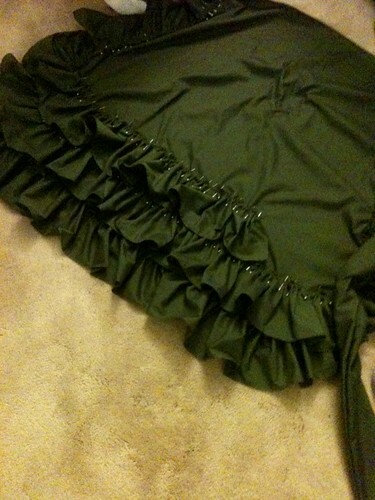 You can also see some of the back of the finished skirt. That’s my process update for now! More to come later this month. 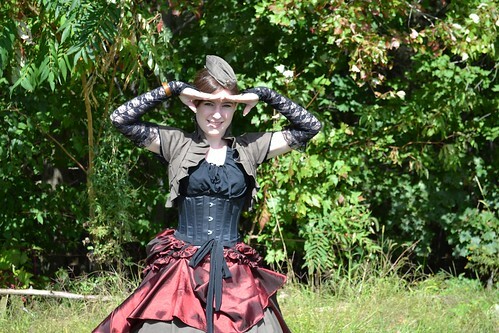 Here is the second variation of my steampunk outfit worn for The Great New England Steampunk Exhibition. 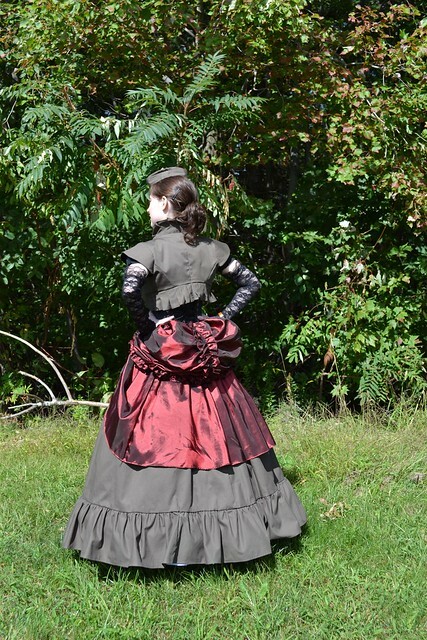 In this variation I have added a hoop skirt under the full length skirt, a bustle pillow under the bustle, traded the over-bust corset for an underbust and black chemise, and added my green bolero. The drama of the skirt and the shoulders of the bolero create an exaggerated hourglass silhouette. The bustle pillow also adds volume to the back which contrasts with the sculptural pleats of the bolero. For the bolero I had to draft my own pattern because I couldn’t find anything suitable that already existed. I got a lot of compliments on my hat and the bolero because no one had every seen them before. I am very excited about how this costume turned out; it is surprisingly comfortable, despite all of the metal and layers involved. 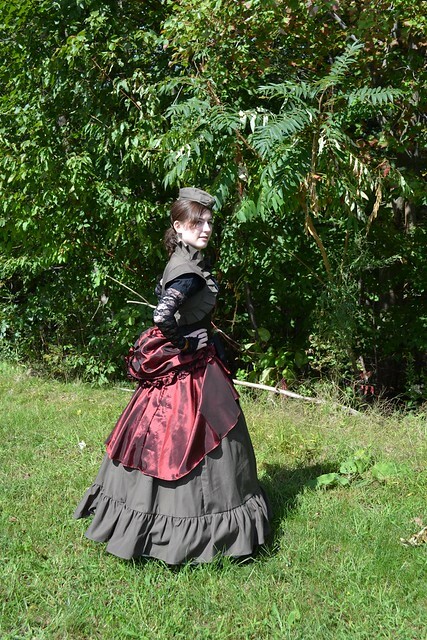 Honestly, if you took out the corset and hoop skirt I could wear this to bed.